Quick question: Is “bull” in its vernacular form a “bad word”? So yesterday we went to West Point. New York. The Military Academy of the United States. Yes, where Robert E. Lee and Jeb Stewart and Ulyssess Grant and Dwight Eisenhower and Douglas MacArthur went to school. I should clarify… we WANTED to go to West Point Military Academy. We couldn’t get in unless every person over age 16 has a photo ID. Which not every one does. Bummer. What IS it with the “papers please” stuff these days? Every where I go, they want reams of ID. The drive is 3 1/2 hours, one way. I misread the Google Maps (or Google deceived me, which I will not rule out, LOL) and I thought it would take 2 1/2 hours. Let me tell you, there is about a 4 hour difference between 2 1/2 hours and 3 1/2 hours. Especially if you have my GPS, Richard. Yes, Richard was at his old tricks again. I’ll have the scoop later. Needless to say, I am quite saddle sore today. Anyway, we visited the WP Visitor’s Center and Museum in Highland Falls, instead. It is a very nice museum, incredible history and some really stunning artifacts! They had the carved wooden eagle that hung over one of the Nazi Third Reich headquarters (Patton’s men picked it up). They had enormous cartridges from Civil War ships– they even had a piece of Old Ironsides, the Civil War battleship. Tons of amazing stuff. But the thing that took the cake was this. That, my friends, is what you have been waiting your entire life to see. It’s the face of Sitting Bull. Wonder no more, my friends, we now know exactly what he looked like. The poor man’s sculpture: a plaster mask. According to the placard, it’s the Life Mask of the notorious Indian. 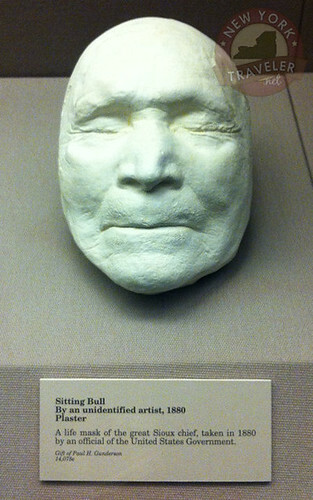 As opposed to the Death Mask (a a common practice in ancient times). What I’d like to know is how the guy breathed while waiting for the plaster to harden a bit. They didn’t have straws back then (?) so he couldn’t breathe through his nostrils…. hmmmm… I also find it amazing that Sitting Bull allowed a “government official” to do this to him. People must have been WAAAY more trusting of the government back then, because there’s no way I’d let an IRS agent slather my nostrils with plaster, even if his intention IS to keep me alive and paying as long as possible. I think he looks a little bit like George Bush. What say you? Hey, My Michigan Pals, Did You See This?